Q1. What should I do to protect my USB drive after installing the program? Simply run the program, either by double clicking the drive icon in 'My Computer' or choose the option 'Password Protect this USB drive' from the AutoPlay list you see after plugging your USB drive to your PC. Once the program is launched, you can set and confirm a password in the fields that pops up in front of you. Make sure the password you choose is easy for you to remember and hard for anyone else to guess. Q2. What should I do to open my protected USB drive? USB Secure offers you two different methods to access your protected data. You can either choose 'Open Data in Virtual Drive' or 'Extract Data to USB Drive'. 'Open Data in Virtual Drive' will open your protected data in a virtual drive without extracting it to your USB drive so that you can access, add, delete, move, copy or edit your files. However, if you wish to extract your data to your USB drive, you can choose 'Extract Data to USB Drive'. Select how do you want to unprotect your data, enter correct password and voila! Q3. How do I disable the AutoPlay feature? Run the program by entering correct password and click 'Options' where you find three options: Enable Autoplay for This Device Show Auto play list containing USB Secure Execute USB Secure on Auto play To disable Auto play feature unchecked these boxes and click 'OK' to finish. Q4. How can I change password? Q5. Is USB Secure free or a Shareware? USB Secure is NOT freeware! It is shareware, which means you can try it before buying. We give you 3 Free trials so that you can test the program and check whether it is useful for you or not. If you find it useful and want to keep it, register your copy and get a full version registration key via email in minutes. Q6. Can I buy the program without first trying the evaluation version? You can but doing so will curb all your chances to try the software for free. We don't need your money as much as we need your satisfaction. It is therefore strongly recommended that you try the software first before purchasing. If you are happy with it, then pay us and register. Q7. How can I suggest a new feature for the future releases? We give high priority to our customers' suggestions for future versions of our software. If you have a feature request, be sure your copy is registered and let us know via Contact Us form. Q8. What's the difference between trial and full version? What are the benefits of registering? Registered users will get: A Full version to download that does not have any trial limit No trial reminders, no functionality limits Life-time priority customer supports Free Upgrades to all minor versions of USB Secure Ability to protect unlimited data for unlimited period of time Ensures complete privacy leaving no future headache Feature requests will be welcome No hidden or subscription charges at all. Total peace of mind from security leaks and privacy breach A personal Thank you message from the developers of the product. Q1. Can I order online using my Credit Card or Paypal? Q2. Which Credit Cards do you accept? We accept most Credit Cards like VISA, Master Card, EuroCard, American Express, Discover, Novus, Diners Club, Carte Blanche, JCB, Switch and Solo. Q3. Is your order site secure? Is my Credit Card information safe on this site? Q4. Can I order via FAX, Phone, Mail, Purchase Order or Bank Wires? If you prefer not to order online, you can send your payments via FAX, Phone, Mail, Purchase Order or Bank Wires. Please click 'Register Now' button in the program and then click 'Buy Now '. You'll be able to see our FAX, Phone, Mail, Paypal and Purchase Order methods below. If you can't find information there, kindly visit our site and contact our customer support department. Q5. What is the price of the full version of the program? It costs only $29.95 to own a full version of USB Secure. Please note that this is a limited time offer. Prices can go up unexpectedly. Q6. I can't afford the program? Can I have a discount? 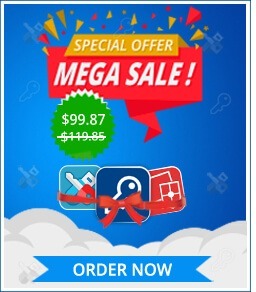 We will give special discount coupons for users who have annual earnings of less than US $20,000. If you are in this category, please contact us. Coupons are not available to users in the USA, Canada, UK, Australia and European countries. Q7. Do you have any discounts for multiple licenses? Yes, there are good discounts for multiple users purchasing multiple licenses, starting with a 15% discount for two users. Please check out our site for more information. Q8. How many licenses must a single-user buy for multiple USB drives? A single-user license allows the program to be run on ONE USB drive only. Q9. Can I buy an academic license? Or a site license? Yes, we offer special discount licenses for all types of organizations and academic institutions. Q10. Can I send you the cash or the check through postal mail? Yes, you can. To do that kindly read Get Full Version > How to Buy? Q11. Do you guys accept cash currency of my country? We accept cash currency of many countries. If you wish to pay through this method, please email our Support department at mailbag@newsoftwares.net. Tell them the name of the product, your currency, the conversion rate of that currency and ask whether they will accept it. Q12. Why to buy multiple licenses for multiple USB drives?